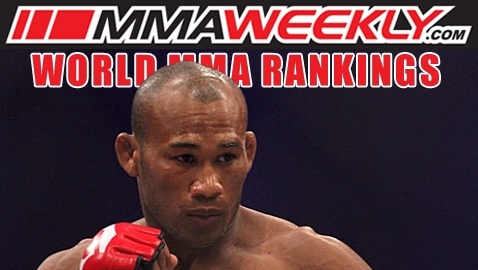 The updated MMAWeekly.com World MMA Rankings were released on Thursday, May 23. This system ranks the Top 10 MMA fighters from across the world in each of the seven most widely accepted men’s weight classes and the Top 10 pound-for-pound women fighters. Notes: Brian Bowles and Dominick Cruz are ineligible for consideration because they haven’t fought in more than a year. Pat Healy is ineligible for consideration because he is currently serving a drug-related suspension.